A sleepless night; do you have a b**ping mobile phone? There are many reasons to swear at your mobile phone. I’ll talk about just one. I have just had a sleepless night. I was staying in an Oban hotel and needed to get up at 5:45am for the Tiree ferry. I went to bed early, but not too early, intending to get a good night’s sleep before the early start. But I seemed to spend the entre night tossing and turning. In fact there will have been moments of sleep in between, but it felt like I was always wide awake, not even drowsy. It was only in the morning that i realised the reason, one I should have thought of the night before. My phone is a beeper. Maybe you have never had one, but if you have you know exactly what I mean. … my Android phone is a beeper. Maybe all Androids are, or maybe all Androids with a particular version of the operating system, or maybe just the Samsung ACE, but certainly mine is. It is why I normally have it switched off at night. At random moments, without rhyme or reason it just beeps: little chirrups, very jolly sounding, but often utterly incomprehensible. Some I understand: a message has arrived, the power has been connected, it is fully charged and wants to be disconnected. But other times, I hear the beep, look at the phone, and there is no apparent explanation. Of course in the night the beeps wake you up, but as they are short, you don’t realise why yo are awoken. I should have remembered, It is not the first time I have had a beeping phone. My first awareness of beepers was nearly ten years ago. For a period of nearly two years I had continuous insomnia. I would go to sleep, but I would wake nearly (in retrospect probably exactly) every hour. One day I was at a hotel and something else must have woken me and before I fell back to sleep I heard a beep. I think I had a Sony-Erikson phone at the time, and when it was fully charged it beeped. If you ignored the beep it would wait an hour and then beep again, and again, and again. In the daytime I had hardly noticed the habit, but in the night it woke me, but of course I had never realised what had woken me, until that moment. The next night I turned off the phone and used a separate alarm clock. For the first time in two years I slept through the night. Walk around your house at night: it is now rarely dark, every device has an LED some, continuous, some flashing; indoor light pollution. Have you, like me, sometimes had to cover a laptop with a T-shirt to stop its flashing keeping you awake? Less obvious are the various beeps, buzzes, and chirrups. Some are loud, long and insistent, the ring of a phone, or loud ding of a microwave when ready. Others are short and sharp, deliberately low-key so as to remind, but not annoy. In our house the tumble drier gives a small periodic beep to remind you that the programme has finished. During the day time these are just part of the backdrop of life, indeed if you live in town they may well be drowned by the background drum of distant traffic. However, if you find yourself unaccountable waking at night, seek out the audio polluters of your home. Because these reminder sounds are short, you never know what woke you, but like any unexpected sound in the night, they hit your deepest startle responses and leave you suddenly, unaccountably, wide awake. Of course, the phone knows the time of day – that is why I used it as an alarm – so why not mute the less critical sounds during the night. And yes, I have tried lots of settings to quieten it, but some, particularly power-related beeps, seem insensitive to my attempts to silence them. And of course I do not want to silence the potential emergency phone call in the night, just the inconsequential reminders. Of course, if the phone does insist on beeping at least it could have some sort of notice to say why! It is not just these notification beeps that can cause problems. IT systems, and phones in particular, seem remarkably time insensitive. My first mobile phone was on Orange, supplied by my university when I was an Associate Dean and part of ‘management’. Orange specially modify their phones, so that, even on early phones, you got visible indications of phone messages. Furthermore, if someone rang you and left a message while you were on the phone or temporarily out of signal, you would get a call back from the answering service as soon as you were available. Later, when I had a phone of my own, it was Vodafone. Vodafone’s answering service on their mobile network appears to be completely separated from the actual phone system. There is some sort of ‘redirect on busy’ that takes you through to the separate system, but, unlike Orange, it has no way of knowing when you are next available. Now-a-days it seems to only text you, but, maybe because the service started before text messaging was common, the early versions worked by ringing you back. However, being unaware of your availability, it simply rang you back at increasing intervals: first of all immediately the message had been left, then a few minutes later, then a slightly longer gap, until eventually it would give up for several hours before trying again. You can probably already imagine the story. It was quite common to have long phone conversations with family members late at night, maybe at 10:30 or 11pm for an hour. During that time someone else would try to ring and leave a message. The answering service would try to ring, but of course we would still be on the phone, then a minute later, five minutes, ten, twenty minutes, but we were still on the phone. Eventually it would give up and wait two or three hours. At 2am when we were fast asleep the phone would ring. Thinking it was a dire emergency, we would leap out of bed, only to find a short message saying, “sorry to miss you, will try again tomorrow”. How difficult would it have been to alter these timings at night? I said I used the iPhone as my normal alarm. It does make the occasional incomprehensible beep, but usually only just after you have been using it. I assume these are due to some operation started by your interactions completing, maybe mail arriving, but I can never tell. Just as on the Android, would it be too much to ask, even if only as a UI guideline, that every audible notification has a clear visible explanation as well? However, on the whole it is a silent sleeping partner. I have iCal connected between phone and laptop and also to my Google mail. The default import seemed to set both the Google events and events received by email as ICS attachments to have a 10 minute notification. Although I didn’t necessarily always want this, it was not a big problem. Except for all-day events. 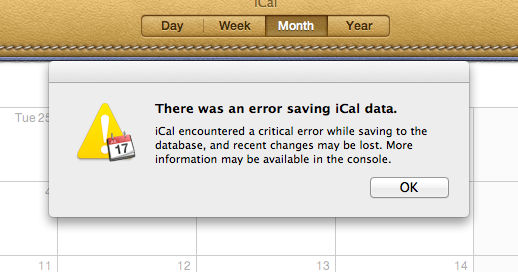 These are recorded specially on both platforms and iCal certainly knew they were day events. An example might be that a conference was on. We now come to what the telecoms industry calls a ‘feature interaction‘ problem. Although iCal knew it was an ‘all-day’ event, for notification purposes it treated the event as if it was a timed event from midnight to midnight. So at 11:50pm, the night before the start of an event, a notification (with associated beep!) would sound on the phone. I rarely go to bed before midnight, so this was not usually a big problem, except when travelling abroad. In Italy this is at 12:50am, in Greece 1:50am. When I first noticed the problem, I was back to turning off the phone and using an alarm clock. I tried to simply turn off the notifications, but here I hit another feature interaction problem …. except here the ‘feature’ that caused it was equally incomprehensible. When an event comes in via email, iCal regards it as in some way ‘not your own’ and (on the laptop version) you cannot edit it, only delete it. The event is not live linked, it is merely a copy, so I can understand in some way marking it as edited, but why prevent you from editing it? For example, if I have had an email notification of a meeting and then a call to say the meeting has moved, I can only delete the original (with its associated notes, distribution list, etc. ), and create a new one. Some years ago a colleague sent an invite to a regular Thursday meeting. When the meetings stopped, he sent a cancellation. iCal associated the two, and so the meeting stayed in my diary, but ‘crossed out’. Years later my diary still had this regular meeting, but I was worried about deleting it (the only action available), for fear of loosing the old meetings that had actually happened and might have important information attached. Enough time has passed and I just tried. Sure enough it did delete all copies of the meeting past and future, with no dialogue to ask or confirm. Furthermore, (a) the action was not undoable and (b) a few moments later, I got the following error message. So far, so bad, but, on the iPhone, iCal not only does not allow you to edit these ‘foreign’ events, but you cannot even delete them. So, even when I can see that an event will wake me in the middle of the night I cannot get rid of it except from my laptop. While I still cannot delete these events from the phone, at some stage I have managed to find the right setting so that the notifications do not come in the early morning, so now the iPhone is usable at night. do not create Fascist systems (Apple that includes you) – it is my device and my data. Surely retain some marker or indication that I have edited things that originated elsewhere, but if it is on my machine I decide what can and cannot be edited or deleted.